A rarely available semi-detached villa, 45 Hawkhill Drive is a well presented three bedroom villa, with kitchen/dining area, conservatory, off street parking with garage, and south facing rear gardens. In summary the property layout extends to entrance vestibule, with hallway, front facing lounge with French doors leading to the spacious and well presented kitchen/dining area. The kitchen is well stocked with a number of wall and floor mounted units, gas hob, oven and hood. The kitchen has French doors leading to the conservatory that overlooks the south facing rear garden. The upper level is accessed via the stairs off the hall with three bedrooms, two of which are doubles, all of which benefit from storage options. The remainder of the property’s living space comprises of a beautifully finished shower room with WC and WHB. Externally the property has gardens to the front and rear. To the front it is laid in decorative chips. To the rear the property is beautifully finished. The garden is south facing. The rear garden is laid to patio slabbing with a raised decking area ideal for summer dining. The rear garden also features a timber shed. manicured and is laid in a combination of lawn, decorative chips, mature shrubs, and feature decking. The property benefits from triple glazing, gas central heating, driveway and detached brick garage. 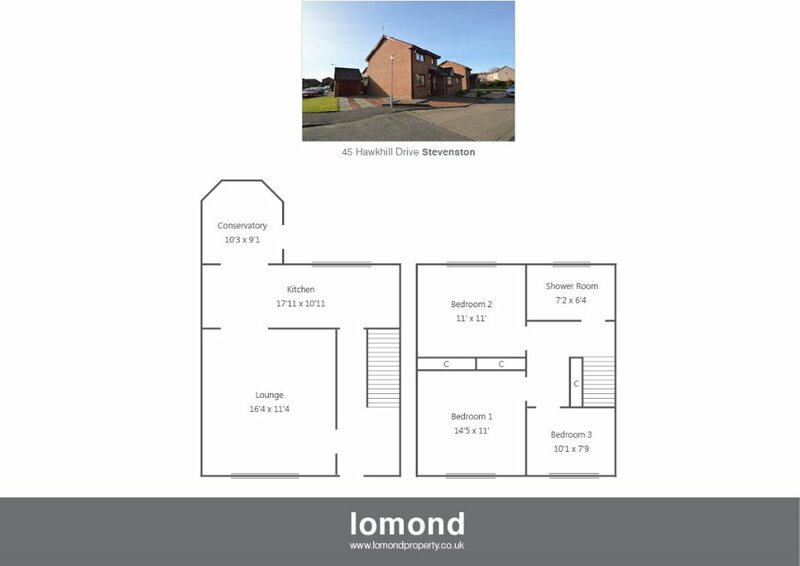 The property is located in an established residential area developed with similar types of properties and is conveniently located in relation to a typical range of local facilities and amenities including schooling, shops and bus routes. On entering Stevenston on the A738 continue along and at the first roundabout take the second exit onto Hawkhill Drive. Number 45 is on your left hand side.